Sometimes during manual link identification you come across low quality copy in the form of articles, blogs, or forum comments. The copy won’t really make any sense, and or doesn’t really have anything to say. These are often not mechanically generated, but have been written cheaply for the sake of writing something to contain keywords and a link. These are often written by someone with a limited knowledge of the language they are writing in, or the subject that they are writing about. This type of content is easily identifiable to search engines and should be removed accordingly if at all possible. 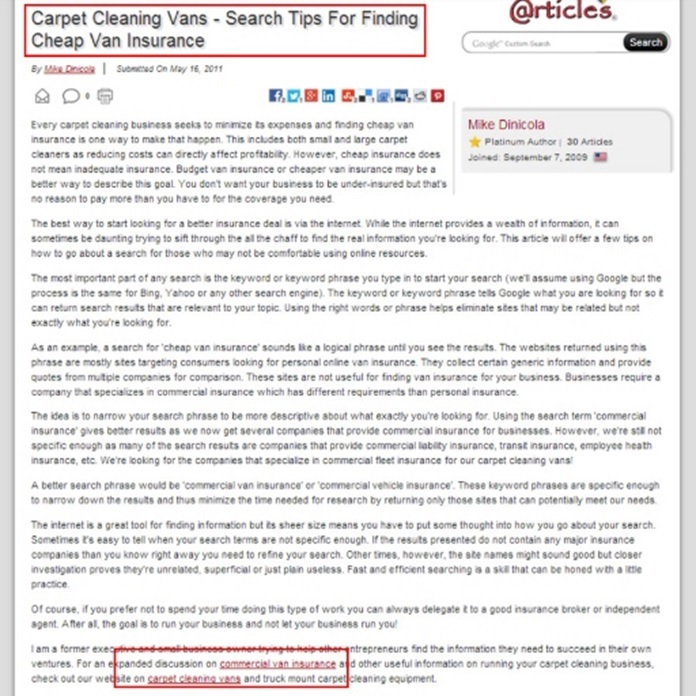 In this example the title gives it away right from the start, and anyone brave enough to read on will quickly realise that this copy has been produced for the purpose of keyword stuffing the phrases carpet cleaning vans and commercial van insurance into the page, and linking out to another website. This link should be removed and disavowed. You can usually find low quality copy on low quality sites. Webmasters, editors, or real bloggers would never dream of putting poor quality copy on their websites.